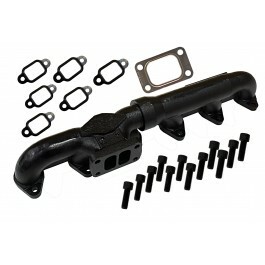 This exhaust manifold moves the turbo away from the A/C box on the fire wall and provides about 6" of clearance, with additional hood clearance as well. The turbocharger must be re-oriented so that the oil drain tube points straight down. Stock manifolds are known to shrink significantly, causing manifold-cracking, gasket problems, and exhaust flow problems created by exhaust port misalignment. The 2-Piece Manifold, on the other hand, allows manifold to expand and contract with heat, eliminating warping and cracking to the manifold, eliminating the dreaded manifold shrinkage. 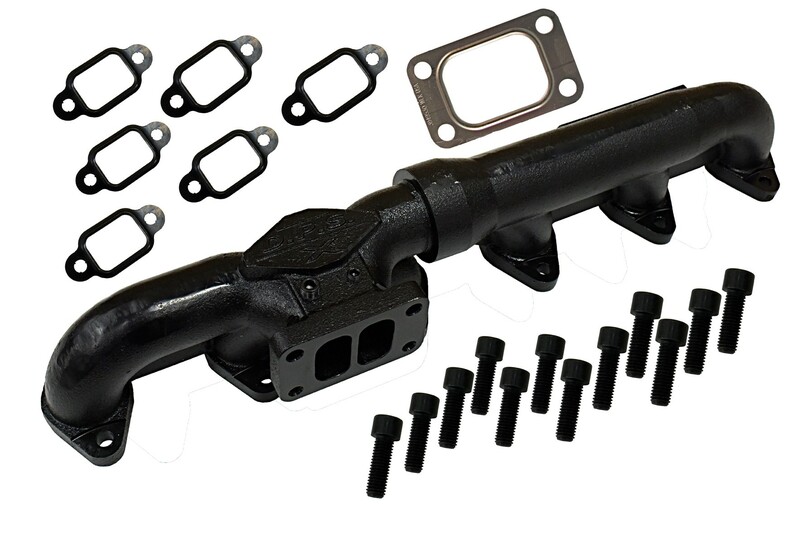 This 2-Piece Manifold has improved air flow allowing better fuel efficiency while increasing overall horsepower and torque. If you intend on utilizing the stock turbo charger (Holset HX 35) you will also need to use the waste gate actuator SKU 3048.